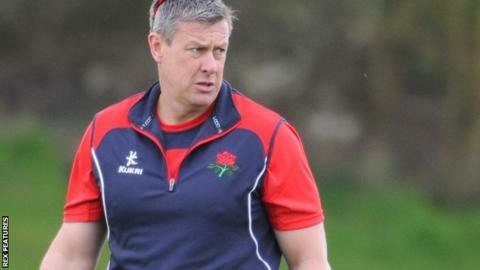 Head coach Ashley Giles says he is delighted with the way Lancashire have started their Championship season. The Red Rose are second in Division One, having won two of their opening three matches since being promoted. "There was a lot of talk of us going straight back down, but if we continue in this manner we'll be in a good spot," Giles told BBC Radio Lancashire. "We have talked about being relentless in our discipline and we've done that consistently." Lancashire have won both of their home games this season including a victory by an innings and 94 runs in their last match against Hampshire. They next face Durham, a side who have drawn all three fixtures this season, on Sunday. "I'm delighted with the way we've played" Giles said. "The players have worked hard and are getting the rewards." Ashley Giles (centre) has been impressed by the performances shown by James Anderson (left) and Luke Procter (right). Giles, director of cricket and head coach since Mike Watkinson stood down in 2014, also praised the impact of England bowler James Anderson, new signing Neil Wagner and all-rounder Luke Procter. Anderson and Wagner have already taken 27 wickets between them and have the second and third best averages respectively. "There's a good vibe in the dressing room and that's helped by having Jimmy in there," Giles said. "We're bowling well and he's helped with that. Neil has really settled into the side too"
Procter, who played three limited-over matches last season but did not feature in the County Championship, is just outside the division's top ten batsmen after scoring 137 at Old Trafford earlier this week. "It was a gamble to use Luke, but we went on the evidence we saw over pre-season. He's done well and gives us good all-round ability and balance" Giles said. "The big score will help him gain confidence for the future."